And I also have in my library an old catalogue from Siliconix where one can find the same graph for the J112 device (and the gate current for it starts to increase substantially only for Vds over 15V . P.S. for 1ppm effect you would need the gate current at about 1-3nA ( for 1-3mA drain current), by the way. Look at the graphs. Even at 125C and 10V the gate current does not reach that level. How well this simple and very affordable JFet-based voltage reference compares to the LM399? Let's assume that one creates a simple "oven" by gluing an appropriate resistor to the J112 as an heater element and places tho whole thing into a styrofoam or similar insulator? Let's assume the constant current through the heater resistor will be good enough to keep the temperature within 1 degree of Celcius. Any educated guesses? 1) The main question would be the long time stability. It is an unknown. My guess would be that unless the junction is damaged by a static discharge, the stability of the JFET itself (especially in a metal can) should be very good to excellent. After all we are looking at a simple single structure, not a complex one as in the LM399 or any other IC reference. 2) It is reasonably easy to create a temperature control down to 0.1 degree, especially for a small device like that, using something like LM35 for a temperature sensing. I am not sure that it is sensible to look at this circuit as a replacement for the LM399 before some long-term tests are done on it. My aim was to show a simple way of making a voltage reference in a rather unorthodox way, and frankly I am surprised at the level of performance actually available from this circuit. I'm beginning to wonder if there is too much emphasis to oven implementations rather than temperature compensation / characterized predictable temperature coefficient in all of these references. Surely long term drift in the oven temperature controller is as much of an error contribution as drift in the reference itself - particularly in a reference as simple as this one (as opposed to LM399 syndrome as Alex hinted). It just seems a bit 'brute force'. Wouldn't putting the whole thing in an isothermal metal box, insulated to limit rate of temperature change and avoid thermal stresses work better in a home lab environment? Putting the effort into characterization and compensation instead. Perhaps the dealbreaker is in repeatability. For mass production you throw an integrated IC with tight tolerances and no worries every single unit of the product will be as good as the prototype. Whereas JFETs characteristics differ largely between manufacturers and even within the same batch. The datasheet for J112 says cutoff voltage can be anywhere from 1 to 5v. Having said that this circuit operates at near cut-off voltage on the gate, chances are each unit will need to be individually adjusted for the specified output voltage. But if you only need one off for personal use then not a problem. Exactly. If, however, the long term stability happens to be in the range of few ppm per year (and I have a sneaky suspicion that it might, given a metal case and a good attention to the construction and the resistors used), than it is a different ball game altogether . For that one may even select the most suitable FETs out of a large batch (I've just bought 100 of J211 from DigiKey - it cost me less than one LTZ1000 would, even including UPS delivery from the US). But we would know that only in a year or so. Or at least in a 1kh after I'll get my hands on the HP3458A . However neither of the 'superstars' ie. LTZ1000 and LM399 is tight initial tolerance. The have quite a large variation requiring adjustments on an individual basis. Stabilty and long term drift are excellent but initial tolerance is poor. I might be wrong, but I found J112 to be TO92 and SOT23-3 only, no metal can. So humidity sensitivity can cause a big influence, right? A big advantage of your U440. Yes, that is correct. However the humidity sensitivity is usually due to the resistors on the chip, here we don't have any. It is possible that for a JFET even in a plastic case it should not be a problem. Now I need an environmental chamber as well! Nah, that would be too easy. I am looking for fun, not for gain . P.S. - on the other hand, the LTZ needs a very good board layout and a lot of expensive supporting electronics. Sort of fun too, but it is already a known road . however the humidity sensitivity is usually due to the resistors on the chip, here we don't have any. It is possible that for a JFET even in a plastic case it should not be a problem. Are you sure about that? What about the Source-Drain-channel, not some kind of a resistor though? Not sensitive to mechanical stress? The only way to be reasonably sure is to test thoroughly. I have no data on a single JFET package sensitivity in that respect. On the other hand, everything is sensitive to everything, the only question is to what degree . Does a metal can maintain constant air pressure? AFAIK, strictly speaking, no, as it is though a metal package is hermetic, but not evacuated, and the internal gas pressure should change with temperature. There is a 1973 US patent (long expired now) 3,760,199 that details a manner for determining a compensating voltage for biasing any JFET into it's 0-tempco region. The goal of the design in the patent was to determine Vp, the pinchoff voltage, at any temperature, and a compensating voltage Vc, such that Vgsz, the gate-source voltage needed to bias the JFET at its 0-tempco region was Vgsz = Vp + Vc. Since Vp, the pinchoff voltage is temperature dependent, then he develops Vc = 0.64 + a temperature dependent part opposing the tempco of Vp. With proper placement of some PN junctions and some BJTs and resistors, and a little bit of KVL, the inventor develops a voltage loop involving Vp, Vc and 0.64 and places the second JFET's gate-source across the point where those voltages are summed, yielding Vgs = Vp + Vc + 0.64, without ever knowing what Vp was (so it can vary with the standard process variations). The second JFET will now have this temperature compensated bias voltage applied to it's gate wrt source and develop a nearly constant drain current that is, for the most part, temperature independent. Very Cool! It's an easy patent to read and a good one too. I think it was intended for use at chip scale, so that all the elements are matched and isothermic. It might not work with discrete parts if someone were to try it out. Immerse it in mineral oil in a tictac container. No humidity effect and more temperature stability. Now that I have my scavenged cryocooler getting to temperatures it can liquify air ( ) and keep high temp superconductors superconducting indefinitely, I thought a neat trick would be to be the ultimate volt-nut and combine it with my rubidium standard to make a Josephson junction voltage reference. First step is to get a SQUID working, it would at least show the effect is reproducible with my setup. I think it is unlikely I will succeed on my allotted budget, but I am sure it will be a fun ride anyway. Well, my 100 of J211 arrived from DigiKey and I've measured the cut-off voltage on the lot at 5V Vgd. Actually, a very consistent batch for JFETs, it looks like the processing did improve since 1980s. All hundred measured between 2.75V and 3.35V at ~3uA current (10M of Keithley 2015 on 100V range between the source and gate). My "experimental" U440 measures 4.6V in the same setup (and the zero tempco point is at ~3.74V, so the "theory" about 0.63 or 0.64V is not working ). One obvious bad point about plastic casing - there is some photo-sensitivity, so the device should not be exposed to light when used as a reference. Not much of a problem though. I am nearly finalised a complete reference circuit, which would take 12-24V supply and provide 10V output with up to 10mA current available and would contain only two FETs, an opamp and few resistors. Not temperature regulated - that would be the next step. I am not going to publish a complete circuit any time soon, only measurement results . I plan to include a temperature sweep from 0 to 40C and a 1000h stability test against LM399 (I don't have LTZ1000 ). OK, let's not get all this popcorn wasted . I've decided to try a very simple circuit to get 10V output and to use the J211 transistor as a reference. This is a "budget" solution, as it requires only two good quality resistors (R1 and R2 and I've used 15ppm metal film for that, "padded" to the required value by some standard 100ppm/C resistors, so I should not expect much better performance than this value), cheap J211 JFET and an inexpensive INA133 chip connected as a gain 2 buffer with low tempco (~2ppm/C). Altogether is less than £10 in parts (resistors R3-R6 are internal for the INA133). My estimate is that the temco around 23C is indeed about 10-15ppm/C. The power supply voltage variations from 12V to 28V create less than 2ppm/V change. The load regulation is better than 0.5ppm/mA (a conservative estimate, as a load current up to 5mA, sink or source, creates less than 1ppm voltage change). The supply current is about 2mA. First R1 is selected for the lowest tempco and then R2 for 10V output voltage. I've seen this schematic some days ago in the LF355 datasheet, it made me think about you! Your idea is not new. Thank you, I always thought that it was used before but couldn't find a confirmation! P.S. - would be interesting to find if that circuit was used somewhere in practice! P.P.S. - The 2N4118 has a very low drain current (around 100uA for near-zero tempco) - it should make it good for low power but fairly noisy as a reference. A higher current device would make it a very low noise option - much quieter than ~1ppm p-p LF noise of the LM399. Well, my two prototypes (5V with U440 and 10V with J211) are running nicely and manage to stay inside +/-10ppm range at a somewhat varying room temperature, without any obvious drift. I am waiting for some high stability wire-wound and bulk foil resistors to be delivered so I can start building a "superstable" version, where all influences except that only of a JFET itself would be below 1ppm/C. The aim is to get a stability better than +/-10ppm in 20-30C temperature range (or better than 2ppm/C) without temperature stabilisation and then check the long-term drift for 1000h with a temperature log. P.S. - here is a 30min run on the bench of a somewhat "fine tuned" version on J211 device. Vertical scale 1ppm/div, Keithley 2015 works with a 10x averaging filter at NPLC10 to reduce the noise. Might it be possible to get a low chosen voltage (say 2.5V) at near zero tempco by using an opamp based "constant" current sink in parallel with the source resistor? It is not difficult to get lower voltages - just by choosing a different JFET. The sample of J211 I'm using right now has the reference voltage around 2.6V and J112 I've tried earlier - even lower, about 1.7V. I suspect however that it could be better to have this voltage as high as possible for a low noise and better stability. The point wasn't to get a lower voltage, the point was to get a given voltage. It would be nice to have the elegance of the first circuit (where variations from everything but the JFET on output voltage are highly attenuated) but at a specific voltage. If you have 2.5V you can make 5v out of it with a switched capacitor circuit. Well, in that case an additional current source should also have a very high stability (means at least some top quality resistors) and would complicate things. An additional resistor gives you the required voltage above the reference, nothing more is required. I'd have to the math to be sure, but as far as I can see drift in the current source has an attenuated effect due to transconductance just like variation in the source resistor (but NOT the second resistor you are adding in your current circuits). PS. doing even a small bit of math in my head showed me I was wrong, I was overestimating transconductance by many orders of magnitude. 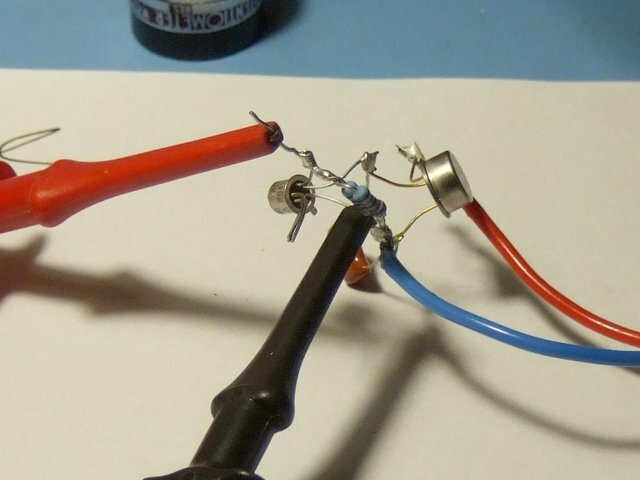 Yes, however there is only one reference voltage point and you can not move it by adding a current, you only can adjust the voltage to that point by an external current if the source resistor has not quite correct value. It is easier IMHO, just to get the resistor right in the first place (or to use a trimmer to get the last 100ppm). OK, Friday night - a torture night . As the J211 version runs rather well and I am still waiting for the bits to build a controlled temperature chamber, I've decided to torture the JVR on record, first with a freezer spray for 10sec (about -50C or 70 degrees drop), then with a soldering iron for 20 seconds flat on the plastic case of JFET (I would estimate it as at least 70 degrees rise). Unlike the U440 in a metal case, some hysteresis is clearly visible, about +20ppm after the cold session and about -30ppm after the hot one. Here I have to note that the freezer session was not the first and on the first session I didn't freeze the FET so deeply, however the hysteresis was more - about 50ppm. Clearly for a stable reference a metal case is much better. (A note - the "wave" on the second graph after 400 samples is just me adjusting the voltage back to 10.00000 Volts). Otherwise it is clear from the graphs that in both cases the voltage drops about 0.2-0.25% or 2000-2500ppm for 70-75 degrees change, so at 23C the reference sits nicely on the very top of the curve and has the lowest possible tempco. With a metal case and the temperature stabilised around, say, 45-50C (and the tempco adjusted for zero at that temperature), the stability should be very good. A quick estimate - the temperature coefficient for this version (10V with J211 and INA133) is about 5ppm/C with few degrees change near 23C and up to 30-40ppm/C at temperature extremes. To compare my results with a quality band-gap reference, I've decided to repeat my torture tests on LT1019-2.5 in DIL8 I had in the lab (with a stated 5ppm/C typical and 20ppm/C maximum tempco). This chip did show however a lot of hysteresis - about +600ppm after a freeze and -400ppm after a soldering iron application, leaving a total permanent shift about +200ppm. Ouch! Since I am new to this game please bear with me. Simply as a first test, I built your circuit without the amplifier and with the components at hand. FET was BF 246 C and 2N 3819 new old stock resting for some 40 years in the box. Resistors were all standard metal film ¼ W, 1%, 50 ppm. Stability of these FETs was pretty awful +/- 300 to 500 ppm over 1 hour. So I had a look at the power supply. This was a LM 317 set to 24 V (to power the amplifier at some later date). Load was 10 mA approx. (dropping resistor and LED) and fed with 30 V from a benchtop power supply. Surprisingly drift was around +/- 5 ppm at room temperature. Then to investigate further I changed the output to around 10 V. Feed voltage now being 20 V. What I then got is for you to see. At the beginning it’s the test rig without me in the room. The droop before the peak is me entering the room whereby the “air blast” seemed to cool the LM 317 a little. The big peak is due to the soldering iron placed at the LM 317 for a short while. Then left the LM 317 to settle with some hysteresis being apparent. 25 ppm approx. So I’ll probably follow this route and put the thing in a metal box and heat it to some temperature. Since the TO-220 casing is flat, I plan to attach flush one BD 139 (TO 126) as the temperature sensor and two further BD 139s on the outsides as heaters bolted together as a single compact pack. Hope this makes for a fair voltage reference, and this with standard components only. P.S: This is great fun. I've just bought the Fluke 731B and a lot of precision wire-wound resistors. I would like at least match the stability on the Fluke (and, as a side point, to be able to calibrate in-house the DC parameters of my two Keithley 2015). While I am waiting for the Fluke and resistors, here is a 21 hours run of the same 10V version using J211. The Keithley 2015 runs with 40 averaging, vertical scale is 1ppm/div. I've noted the room temperature at some time points. It looks like the TC around 23C is ~2ppm/C . I've noted the room temperature at some time points. It looks like the TC around 23C is ~2ppm/C . The TC of the Keithley (according to datasheet) or of the JVR? Your guess is as good as mine - the Keithley TC, noise and drift all included! The only possible clue is that the "fast" changes are more likely to be that of the JVR itself due to the air movements. As you may see there are variations in the evening when I was moving around the lab and in the morning hour when I was preparing to go to work, while at night and during the day there was very little air movement and the changes are more gradual and uniform. I hope that the Fluke 731B will provide me with a more stable reference than the 2015s (I'm running two in parallel though recording only one - and the difference between two 2015 varies from 4 to 6ppm). I plan to record the Fluke against 2015s after a good warm-up and then record the difference between the Fluke and the JVR. I also plan to build the "ultimate" 10V JVR using U440 and a Vishay Foil resistor divider for the 5 to 10V step up. the "fast" changes are more likely to be that of the JVR itself due to the air movements. or changes by parasytic capacitance? have you checked what happens when your hand moves over the cirquit or touch the power supply and voltage output lines? My "zero quiescent current voltage regulators" were very sensitive in this regard. (several volts output change without blocking capacitors). I had to use the blocking capacitors to keep the noise away from the gate diode. No, these "fast" changes are actually quite slow - minutes. And the reference is not sensitive to the external interference or capacitive coupling. I can touch it, move it, shake it and, as long as I don't transfer any heat from my hand to the circuit, it stays rock solid. I am now building a 0.1Hz-10Hz filter-amplifier, with the gain 10000 and self-noise around 100-150nV p-p in the pass-band, so I can accurately observe and measure the LF noise. Well, the Fluke 731B arrived yesterday (no battery though, so I've disconnected R30 to avoid the indicator overload and added noise). It was last calibrated by Fluke in 2009 and agrees with both of my Keithley 2015s within 10ppm on the 10V output. I've run it overnight and it did show about -1ppm/C TC - see the graph below, taken with NPLC10 and averaging over 100 samples. On the previous night I did run my 10V JVR with J211 using the same settings on the 2015. Below both graphs using the same scale. Again, I've noted the room temperature at some points. Next step would be to put the JVR in a suitable enclosure as the "faster" variations are most likely due to the air movements in the room. Well, here now the next development step of my poor man’s 10 V reference based on the venerable LM 317 with its internal bandgap reference. The LM 317 is now heated by two BD 139 trannies on each side with a third BD 139 serving as a temperature sensor sandwiched in between making a single compact block bolted together with a M3 bolt. The arrangement is now insensitive to air movements although not yet contained in a metal box. 1.) Replace the metal M3 bolt and nut of the block with a plastic M3 bolt and nut. 2.) Put the LM 317 block with the heating circuit on an new and clean hole dot matrix epoxy pcb. (instead of the currently used hard paper hole dot matrix pcb. material and avoiding flux residues) in a small metal box. 4.) Do some extended burning-in and subsequent ppm measurements. Watch this space. By the way, my Keysight 34465A DMM set to the 10 V range and with its input shorted produces an output fluctuating at about 0.2 ppm (as measured over 1 hour). So my measurement limit, i.e the contribution from the 34465A in the enclosed graph will be about 10 times that at 2 ppm re. 10 V.
My aim is to produce a voltage reference circuit specc’d for around +/- 10 ppm (20 ppm total) perhaps, using cheap off-the-shelf components only. P.S. Still having fun with this. Messtechniker, schematic and photos please, tia. Where are the voltage setting resistors placed? You need to keep these at a stable temperature too if you are looking at <20ppm stability. Circuit is still at a very early stage (see remark below). Will provide it as soon as I (hopefully) get improved results. The voltage setting resistors are currently placed close to the heated LM 317 but horizontally on the pcb. Based on your remark I'll put them upright and against each side of the LM 317 in thermal contact. Will look messy, but will probably be more effective. Thanks for the hint. I think you could get better results when using a LM723. the LM317 has alone a "typical" noise of 30 ppm RMS = 2mVpp. as chip temperature sensing diode for the oven. Two more graphs, taken at NPLC1, no filtering, for 30 minutes. The room temperature was about 24.5C, the JVR is still in open air on the bench. I was hoping to compare the noise, however the noise in the graphs is completely dominated by the noise of Keithley 2015 . That is the best suggestion . With his resistors and using a JFET in a metal case with high Vgs (like the 2N4391 in my current prototype) it should be possible to make a reference with less than 1ppm/C tempco in 5-6 degrees range and a very good long term stability (my sample has drifted less than 5ppm for last 3 months - at least that is the limit I can measure it against HP3458A Opt002 and Fluke 731B) . room temp ->70degC -> 0 deg C (whatever your refrigerator freezer does) -> room temp. If the JRV does not have hysteresis, it becomes very interesting. Mouser stock these - around about 25c a resistor. Not bad. The specs do not mention 1000hr drift, so that needs testing. Not sure about the higher voltage zero-TC FETS, but the 1.2V MPF102 I tested (it was the one I had) would get 5ppm/C with a 15ppm/C resistor. I guess you could find the zero TC point of the resistor and FET combined and get a lower TC over a limited range. Get a combined tempco of 1ppm, and then put it in an oven with 0.1 degC stability and it should be a nice reference. The TC of the resistor might not be such a big problem, as one could find the point for combined zero TC. The trouble is that you need a different resistor value for each FET. So individual matching / adjustment is needed. So when a pot / digi-pot is used for adjustment two resistors are needed. Otherwise you may need odd individual values - e.g. specially made for the FET or combinations of 2 or more. The more important point than TC is stability of the resistor and possibly the FET also. If stable, even a high TC might be acceptable - though I would not go for a PT1000. so there will be no smear. It pops right out at you. It has a few nice curvetracer tricks. Just a quick update, I've re-measured the JVR after 4 month with the same HP3458A opt 002 (ACAL DCV done in all cases just before measurements) and the result is about -4...-5ppm over that time at the same temperature (24C). As it is in the ballpark of the meter stability, I've checked also the JVR against my Fluke 731B at the same temperature and it shows about -3ppm drift and the Fluke's drift over the same period of time, measured on the HP3458A is about -1ppm at the same 24C. So it all sort of adds up nicely (whatever the real drift is in all three ). I might now do a hysteresis test to, say, +60C unpowered (we have an oven that runs at that temperature) and back to 24C. First results on the hysteresis (from 24C up to 60C for an hour, then back to 25C - in that hour the temperature in the lab gone up 1 degree) - about +1.5ppm and even that is likely to be mostly a temperature change effect. That result is for the complete unit, including the 7 to 10V amplifier and buffers. The shift at ~54C was about -2mV or -200ppm, indicating the tempco of about -7ppm/C box. Near 25C the tempco is about 1ppm/C . P.S. - the voltage measurements graph is added - 1ppm per vertical division scale. While the JVR was in the oven, the Fluke 731B was connected and slowly drifted down with the lab temperature increase. It looks like the voltage should be back within 2ppm at least. Here is the complete graph. It looks like between 12C and 60C I can not reliably detect the hysteresis - if it is there, it is below 2ppm. Susumu RG for less than 15 ppm and Stackpole RNCS for 15 ppm? Both passivated with an inorganic layer instead of the usual resin. Agreed - the Susumu resistors are really nice, far better than typical NiCr resistors. They're also trimmed by laser through the glass layer, after it has been deposited, so there's a lot less mechanical strain left on the part to cause drift. The only issue is that they're tiny SMD chips, but they can be attached to larger thermal masses easily. Edit: The RG series are nice, but the new URG series are even higher precision, along with a higher price. The drawback to foil is when you're using the resistors with low frequency AC signals. The low TC of a foil resistor is done by bonding the foil to an engineered ceramic that has a complementary expansion coefficient. For DC, the current induced foil heating and the substrate will stabilize thermally, and the resulting TC is low. For very high frequencies, there's also no problem, since the waveform changes so quickly that the foil heating is constant over all parts of the waveform. However, with low frequencies, the foil and the substrate will not heat uniformly over the entire waveform, and the foil can expand and contract differently at different parts of the waveform, causing the resistance to modulate with the signal voltage. What's worse is that the thermal time constants can cause the substrate to expand and contract out of phase with the foil, actually worsening the thermal effects of the signal current foil heating. This creates third harmonic distortion, and at just the wrong frequency, the effect is worse than simply using a 'normal' higher TC resistor that doesn't try to cancel its TC with an engineered ceramic substrate. So, for audio or other LF AC uses where distortion is important, foil resistors can perform worse than traditional NiCr films like the Susumus, and can generate more distortion than the amplifiers around them. As far as I know, the Susumus have a low TC by tweaking the alloy and the processing, and not by using a trick substrate ceramic, so they'll have better LF distortion performance than a foil. (p. 9). Which is not to say that it wouldn't be worthwhile to explore this further. That marketing document is OK, but it contains some inaccuracies that are most likely due the fact that ADI wants to sell you on the idea of an XFET reference. Reader beware, and check your facts. For example in figure 10, they show that an XFET reference is somehow "better" than a buried Zener reference for long term stability. Sorry ADI, but this is just NOT TRUE. I think that their XFET reference might be OK if you need low power, but I think they should be more honest. This is not the first time ADI has made false assertions about it's voltage references. It is an old paper (and not really relevant to the topic, as these XFET references use a "band-gap" type 2-FET structure). A single JFET reference would not have that good tempco over a wide temperature range, but can be adjusted for a near-zero tempco at a particular temperature and appears (providing a metal can device is used) very stable in time. It is tempco of 2015, -0.9ppm/K? It's very high out of spec for 731B alone. EDIT: I was thinking about 732B, sorry. Analog Devices has neatly solved this problem by buying Linear Technology. Well, the result from the JVR measured by HP3458A at 25C lab temperature (after 1.5 hours in my backpack and 3 hours warm-up in the lab) is essentially the same as three and half months ago (see my posts from the 2nd/3rd of August) - 10.000055V with about 0.5 ppm variations. The unit was almost continously powered up all this time (except when it was transported from my home lab to my work lab and back). 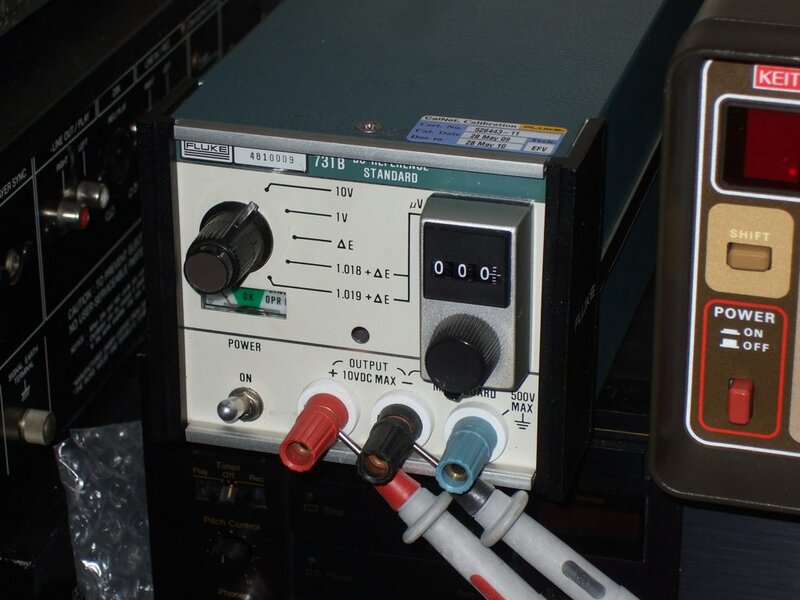 As the HP3458A just came back from a repair and calibration at Keysight UK, I've brought the 10V JVR unit back to the lab and measured it after a good warm-up. Here is the result for 1 hour, at NPLC100 , combined with the similar one hour measurements at the same 25C temperature in August and December last year. I need to build few more of these and get some statistics . I wish I'd have my own HP3458A. I would find a backpack large enough to put it in, no problem . I need to build few more of these and get some statistics . That looks very promising. Build many more and sell them and thereby distribute the work of collecting statistics! Just wanted to mention that I'm planning on building a few of these as well. I have some of the parts, still waiting on others. I'm also in the middle of setting up my meters and fixing some scanners so I can automate measuring of everything. Looking forward to it having some fun! Have anyone used the temp.co difference in the divider resistors to cancel out the reference tempco?? In theory (as two brain cycles without math) it should work. PS. How is the long term spability now or is the prototybe trashed along the years. Look on the previous page. Essentially the voltage is quite stable, using the 3458A meter the difference is few ppm over about a year, certainly less than 20ppm drift for a complete reference including the 7 to 10 volts amplifier stage. Sounds nice.. Silly me I'm still on page 4, it seems also that the resistor? zero tempco point is discussed there. very good results. have you tried cascading the fet's like in the 3-fet design paper? Thank you. For a voltage reference it is not necessary, as long as the supply voltage is steady enough (in my unit it is bootstrapped from the reference voltage, so no problems there). Introducing the second and the third FETs helps to increase the current source output impedance but in turn, adds new temperature dependencies of the second and the third order, so the FETs should be thermally coupled and ideally temperature stabilized as in the paper you've found. I just did a run to characterise the 2N4391 JFETs I have. They are all from Central Semiconductor with a date code of 1620. I lashed up a circuit with a resistance decade box as the resistor between S and G / GND, and supplied 10V from an Aglient E3640A power supply. I measured the voltage at the source pin on my 6.5 digit Keithley 2015 (uncalibrated). Note that the resistance box is not hugely accurate, but it is sufficient to get me in the ballpark and I'll trim the operating point of each circuit from these values. Basic process was to put the device in to a machine pin socket at room temperature (about 23.5C), and adjust the resistance box so that grabbing the metal can with my fingers, increasing the temperature didn't move the last digit of the voltage much (at most 1 or 2 counts). So the I(ds) at the 0 TC point for room temperature is floating around the 1mA point. I'm also planning on testing these same FETs at an elevated temperature (say 50C) as I want to build ovenised references to combat the temperature swings in my office. In Brisbane it can get to 40C on bad days in summer... I'll add a precision OpAmp as a buffer, also in the oven. I'm then considering my options for 10V generation. I'm leaning towards PWM + another OpAmp with a 2x gain and a filter... Then it is programmable.. If you go the PWM route then given the negligible hysteresis wouldn't it make more sense to digitally compensate for temperature than ovenise? That might help stabilise the JVR, as it is quite small. Maybe in the future, but for the initial version, I'll probably ovenise the critical sections, possibly the whole lot. I'll then perturb the oven temperature (say +/-5 deg C) and use that to determine and set the overall system 0 TC point as I should be able to (at least to first order) use the JFET to offset any other system TC. I'm also going for something that can be built and calibrated with minimum of equipment (basically a good DMM and/or null against a +10v reference). I'm not making any quantity so I'm happy to spend the time tweaking the TC of each unit. I should be able to do this by setting up PWM for approximately 10V, then monitoring the output voltage as I slew the oven temperature. Once the TC is tamed, then I would allow the over the settle mid-range for a while and then calibrate the 10V PWM against a suitable reference. Hi MK, thanks for the link. Interesting. I'll probably end up with a bit larger of an oven than that is for. But saved for future reference - thanks! Even without temperature control you still want all the critical components to be in a predictable environment which quickly gets to steady state, which is to say inside a high thermal conductivity housing. The same as with an oven, it just doesn't need insulation. Put some high wattage resistors on it and make your own temperature chamber. Would a heater without any insulation not result in a large temperature gradients, something even worse than temperature fluctuations? Using the same jfet in plastic (to-92) case how worse could be the TC and long-term stability? 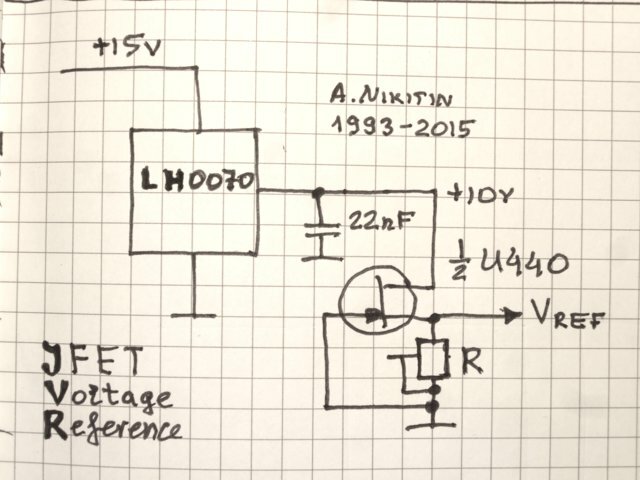 Could be a good idea to consider power jfet with lower on resistance then small jfet? A plastic case JFET can have much higher long time drift due the humidity in the plastics. As this reference also needs a rather stable (and thus maybe more expensive than the FET) resistor, I see little sense in saving a little one the FET. The 2N4391-3 are still available in TO18 case. A higher power FET could result in lower noise, just like using several in parallel. Tomorrow will be two years since I've started this thread. The 10V JVR unit is back in the lab and connected to the HP3458A. The reference was not powered for two weeks in September when I was away for a holiday in Canadian Rockies and Vancouver. It was not affected much (if at all) over this time and came back to the exactly the same voltage as it was before the power interruption. The measured voltage today after 2h warm-up is 10.00008 V at 24C (previous measurements were taken at 25C). Overall, the drift of a complete reference (including the 7V to 10V amplifier part) appears to be less than 5ppm per year (+ whatever the meters uncertainty and drift is, so in total probably better than 10ppm/year ), measured by HP3458A Opt 002 and also compared with the Fluke 731B which looks very stable. I've read through the entire thread of this topic. 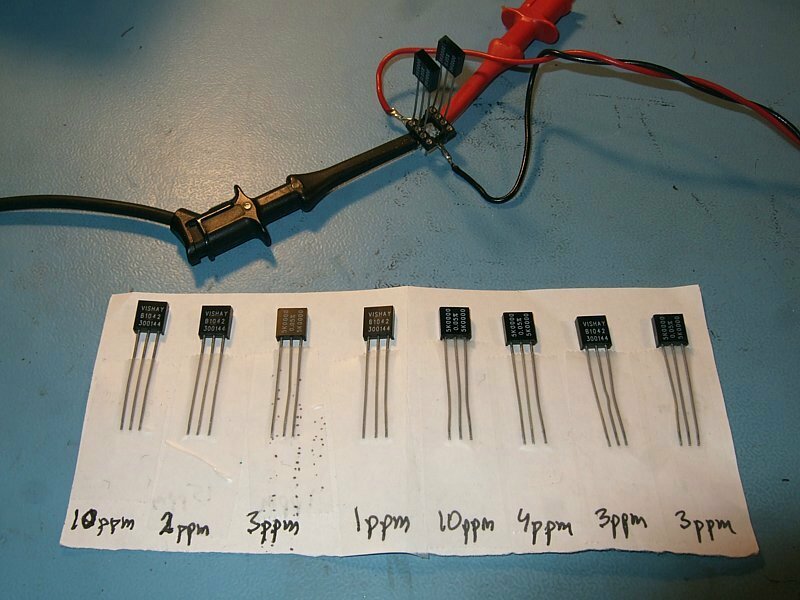 You've got an excellent low-cost voltage reference design by the looks of it. I'm hunting down the parts to make my own now. I was curious if you had had the time to make multiple copies of the same design to use as references against each other, or are you only using your fluke 731B for this purpose? I'm using 731B, HP3458A and an LTZ1000 based reference for cross-checks. The HP3458A Opt 002 (4ppm/year) was calibrated in May this year. I plan to make a proper pcb which would accept either a JFET or LM399 or LTZ1000, and will slide in a standard Hammond case. Sounds like a winning pcb. I've been following this too, and have some jfets ready to go. Can you make the pcb available on (for example) osh? Per the ltz1000 I think you should stick to the datasheet circuit as opposed to the more elaborate KX one (my vote--obviously do what you like). I have my own ideas . Is the schematic for the latest reference the same as the one in Reply #49 on Page 2, except with a 2N4391 JFET and an OPA227 OpAmp? I would like to try building it. Here is the latest schematics (for the unit running for 2 years now). R1 is selected for the zero tempco point, R5 and R6 for 10V output. Is J2 used to start up the circuit? I'm assuming it pulls up the input of the op amp when power is applied, in order to generate a voltage to allow J1 to begin regulating. Ha! You beat me to it. I was just about to type out the very same question. Here is the latest schematics (for the unit running for 2 years now). I appreciate you making this available - Thank you. Yeah, and also, sadly, about fools. Hi Alex, thanks for posting your schematic. I'm thinking of building one up and I have a question. R3 on the output is marked "k12" I'm assuming this is a typo and it should be 1k2? Thanks! R3 is 120 Ohm .